It’s April already, and I realised the other day that I haven’t been sharing much sewing with you lately. January’s ‘wrap up’ showcased the start of this year’s selfish sewing. You can see more in this post here. But if you pop by my instagram feed for the last couple of months, you’ll see oodles of images! 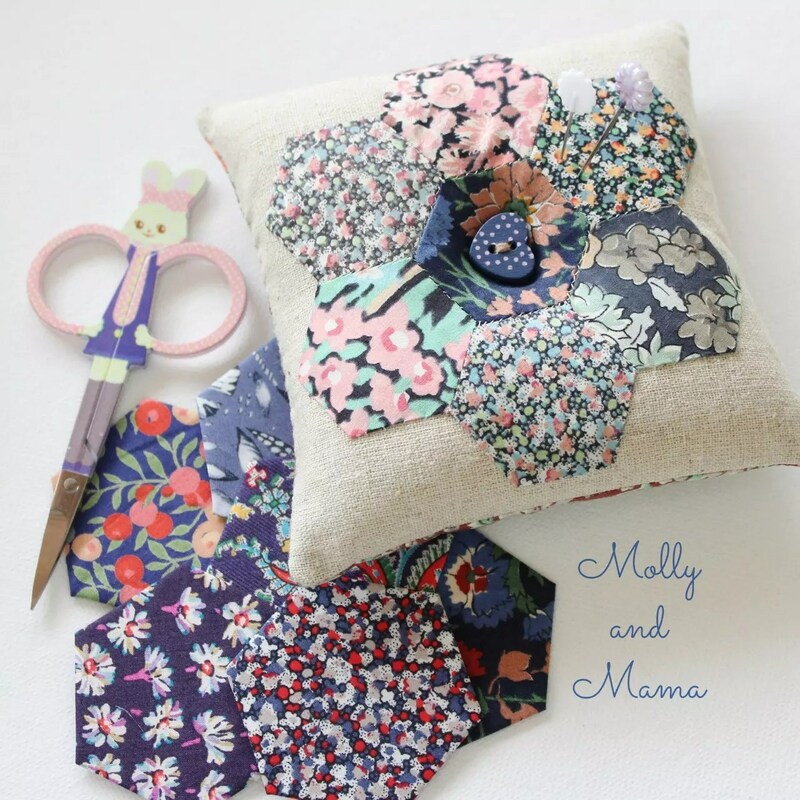 There’s lots of Liberty Art Fabric and a sprinkling of hexie inspired pieces. Add to that a liberal dose of felt projects too! 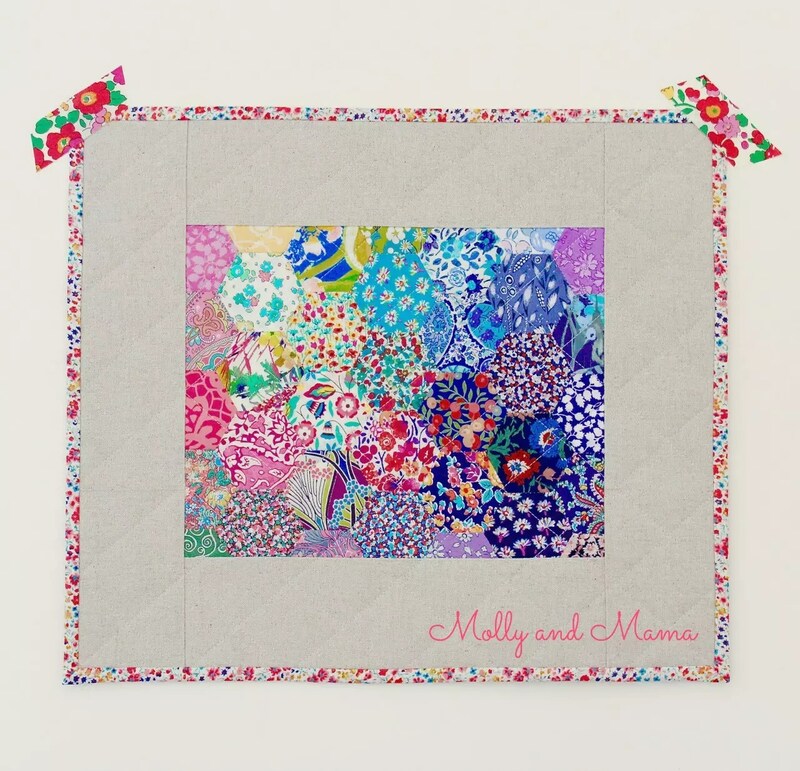 My favourite new sew was this hexie mini quilt, made with Liberty tana lawn and linen. Martina from Ava & Neve sent me an adorable bundle of teeny tiny squares of Liberty fabric. She calls them ‘Liberty Bites’. Cute hey? So I decided to continue my obsession with English paper piecing and hand stitch up these hexagons in a rainbow effect. They’re bordered with linen. And I used Liberty to hand bind the quilt too. I also began a pouch obsession. 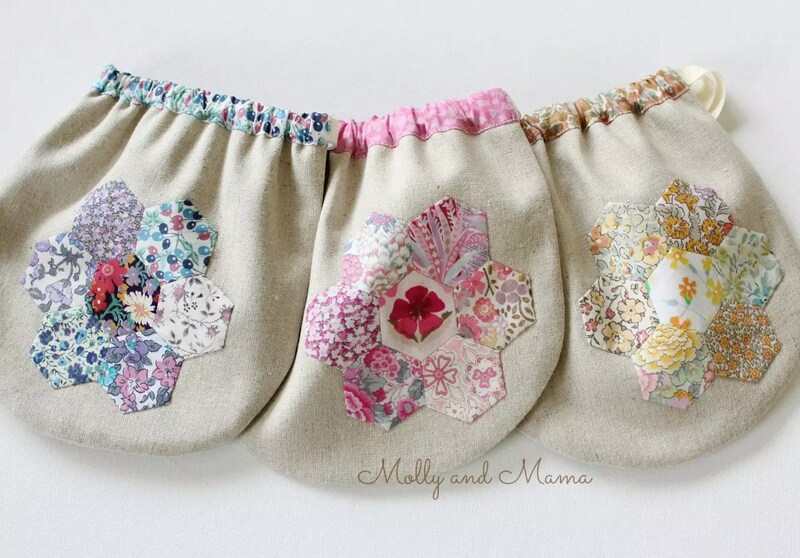 After sewing up a ‘Pretty Liberty Drawstring Pouch’ from A Spoonful of Sugar, I just knew I had to make more. 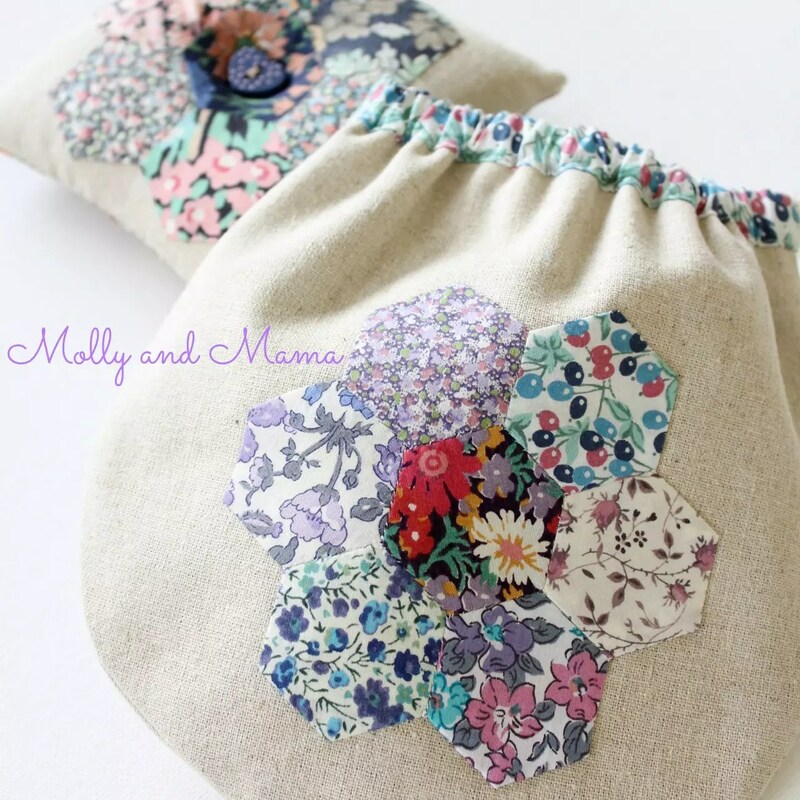 These are made with a combination of new and vintage Liberty tana lawn prints and some stunning linen. A big thanks to my lovely Aunty Judy for the beautiful vintage scraps. Rest assured they’re being put to good use! These hexagon shaped flowers are all hand stitched. After using three handmade ‘flowers’ for the pouches, I had more left over. So I had to make a matching pin cushion for this mauve set. It just turned out so pretty! It’s only super small, but I hate that I can see the stitching. So I’ll be using smaller, tighter stitches next time! 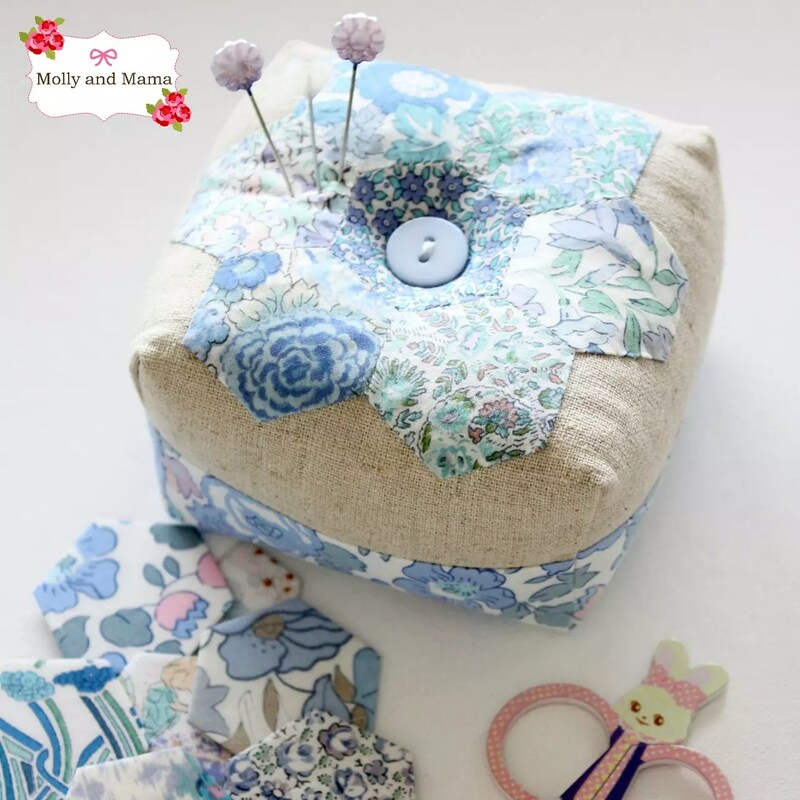 Here’s another pin cushion I made with left over hexies. I love the boxed sides. The mustard and apricot shades in this little bag remind me of my grandmother Molly. She wore these natural tones so well! And how well does the pouch match my cheeky little pin cushion? 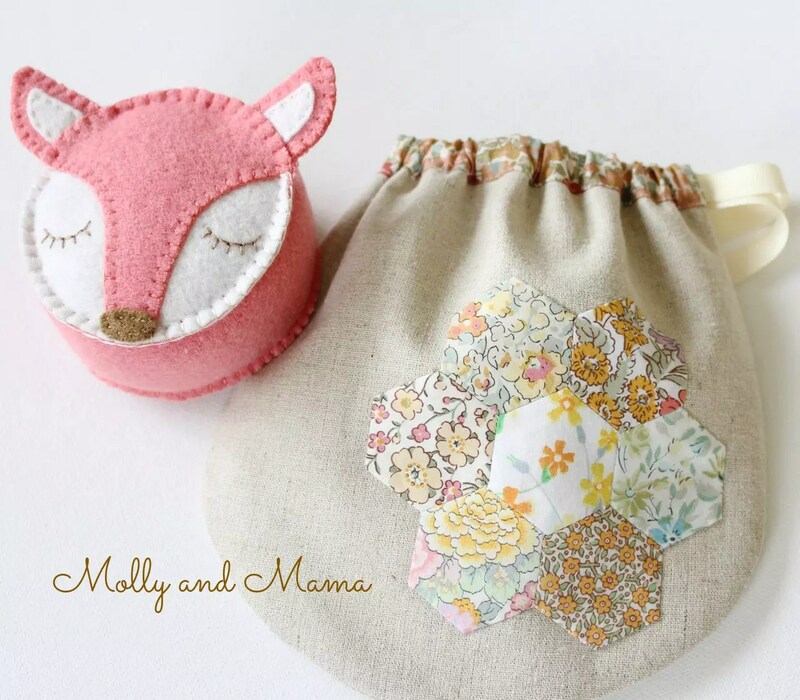 You can purchase the Fifi Fox felt pin cushion pattern in the store. She’s such an easy make, and even suitable for beginners. I couldn’t resist keeping this pink pouch for myself. You know I’m a sucker for pink… and green. I love Miss Molly’s pink and green crochet flower here too. 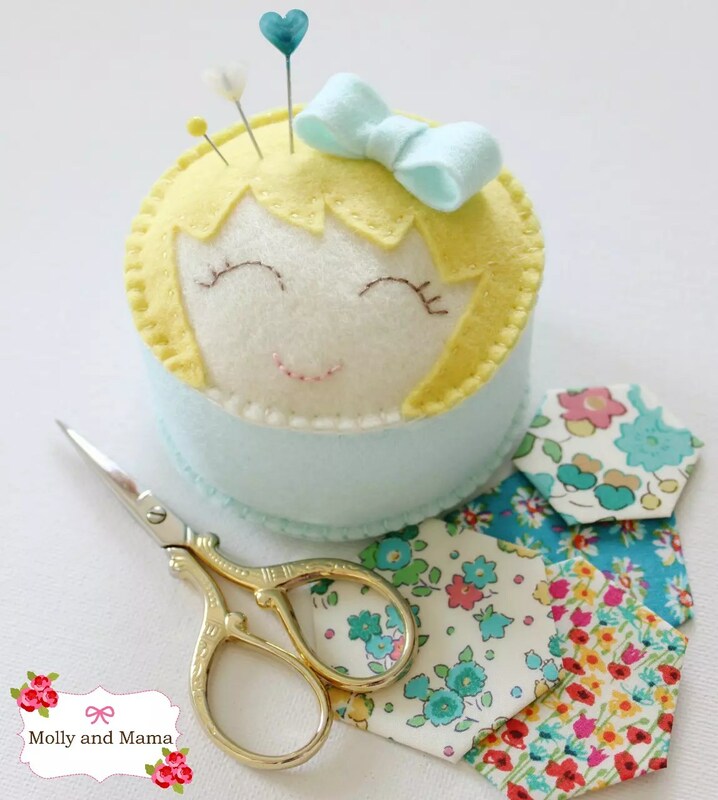 This is such a cute way to add something special to this pin cushion. 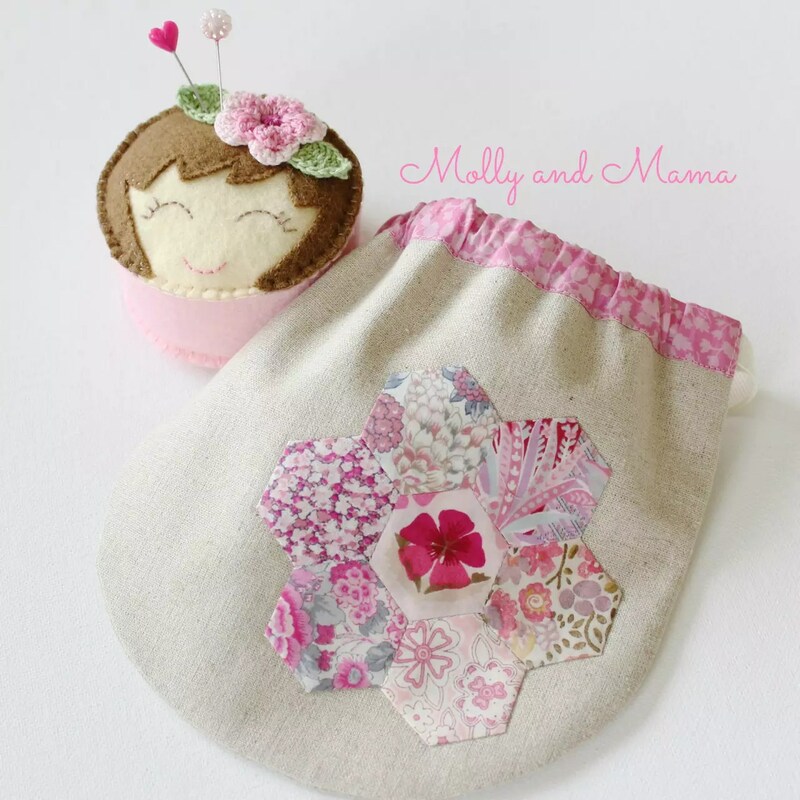 The Miss Molly PDF pattern can also be found in the store. She’s my favourite pattern by far! And Miss Molly got a colour makeover too. A lovely friend of mine Steph, suggested I try out some new colour combinations for her. I’m loving Molly as a blonde. Perhaps I should call her Marilyn! And the felt bow is a cute addition. So easy to make. March also saw me joining a Doll Quilt Swap. A big thanks to Cassie from Three Kittens for hosting the swap. 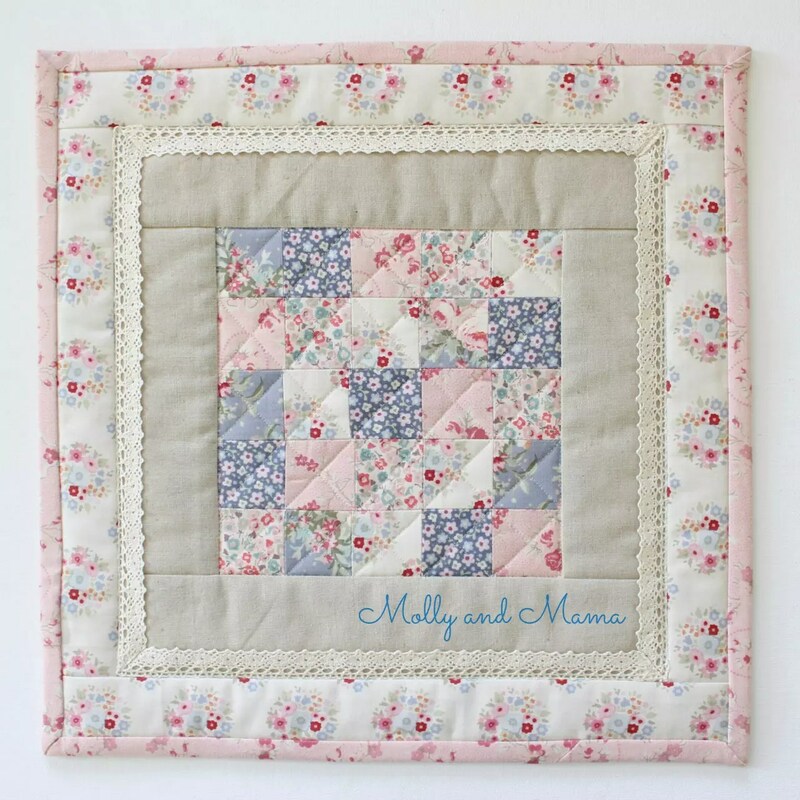 I created this mini quilt with linen, some Tilda and other coordinating florals. I have to admit it was hard to part with this one! There’s just something about this combination of dusty pink, cream and blue. But I received a lovely quilt in return. It’s bright and cheery and lots of fun. So I’m thrilled. April sees us heading into Autumn. The weather is cooling and the days are growing shorter. I predict more time spent inside and lots more stitching! There’s a gorgeous woodland inspired project I’m working on with a friend, that I’ll be sharing with you very soon. I can’t wait! There’s also some new patterns on the horizon which I really hope you love. Look out for the next one coming soon. Pop by Facebook and Instagram to stay in the loop!